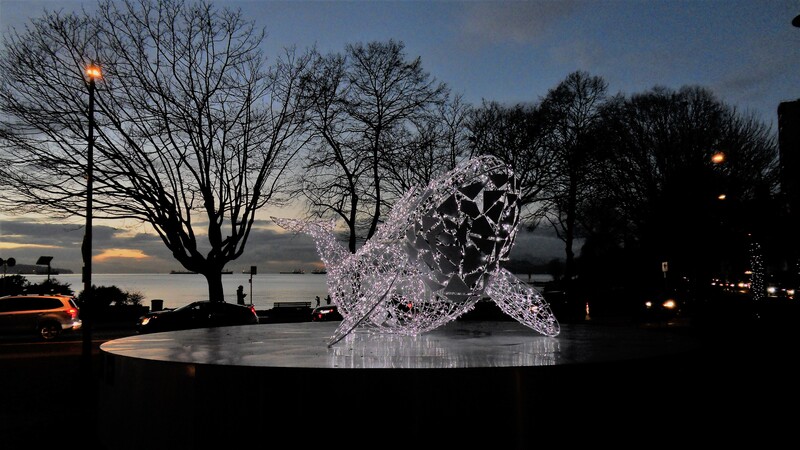 A shot of Luna (the illuminated orca whale sculpture) with English Bay (Vancouver, B.C.) and the sunset in the background. 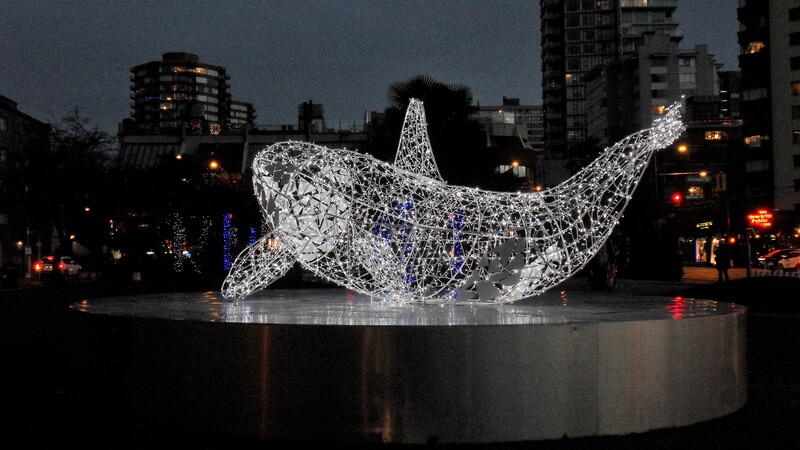 A side view of Luna (the illuminated orca whale sculpture), she never fails to capture our imagination! 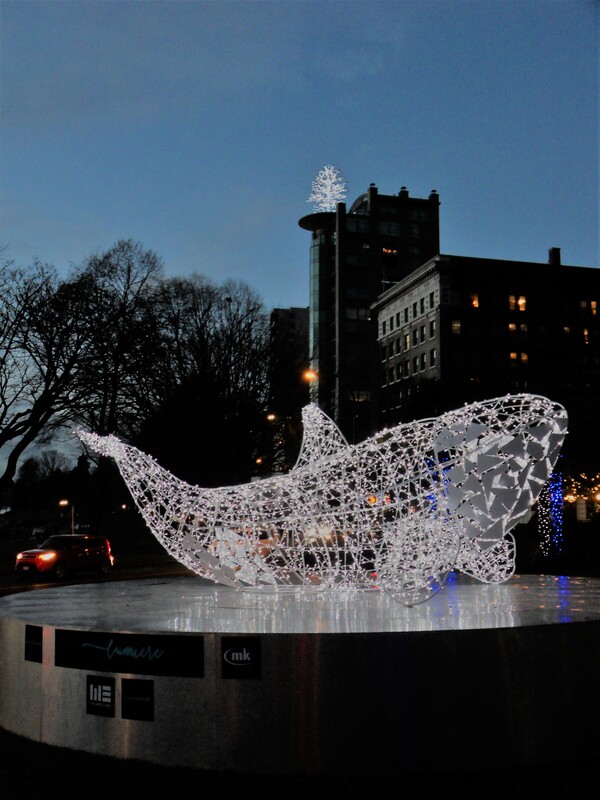 This side view of Luna (the illuminated orca whale sculpture) faces the iconic “Sylvia Hotel” and the magically lit tree on top of a very cool condo building! A small note to wish you all a very Happy New Year – time flies; enjoy every light-filled moment, live loud and be brave (always!)! I'm currently blogging from the beautiful West Coast city of Vancouver, British Columbia - a vibrant city by the sea, surrounded by mountains and a very unique urban forest. This entry was posted in blog and tagged city, dreams, English Bay, holiday lights, illuminated whale sculpture, Luna, magic, memories, New Year, ocean, sunset, time, twilight, Vancouver, winter. Bookmark the permalink. Great shots, we live in a wonderful place. Happy New Year to you, yours, and your bloggers. Thank you for your wishes, Mom and I’m glad you enjoyed the pictures! Cheers! Great capture of our Luna. Inspiring quote. Love your wishes. Yes let’s live loud and brave. May a rain of good wishes take you to the new year and remain with you and your family all thru 2017. Health, love and peace . Huguette. Thank you for the lovely wishes, Huguette and I’m glad you like the capture, she’s a beauty! Hey, thank you for stopping by and I hope you found it wicked beautiful! I’m so glad you find her beautiful – the holidays are passing so fast and I’m glad I could share some shots of her before she is tucked away until next year! Hope you have a wonderful New Year’s Eve!! Happy New Year to you and yours as well 🙂 I enjoyed your lovely post here as well. Thank you for stopping by and I hope you are enjoying this lovely first day of January 2017! What a lovely capture! Wishing you and yours a very happy and fulfilling New Year, Kim! Thank you so much and here’s hoping you have a wonderful new year full of love and light! Great shots! I love Vancouver the one time I went! Great people. So glad you dropped by and I’m glad to read that you enjoyed our fair city, it’s a pretty cool place to hang out! Thank you, it’s so nice to hear from you and I’m wishing you all the best in this brand new year! Thank you for stopping by, I’m always happy to see your comments on my pages!